Activity 1.4: Effects of Temperature & Salinity on Density & Stratification (Steps 1- 4; p. 8; click here for videos accompanying this activity). Stratification refers to the arrangement of water masses in layers according to their densities. Water density increases with depth, but not at a constant rate. In open ocean regions (with the exception of polar seas), the water column is generally characterized by three distinct layers: an upper mixed layer (a layer of warm, less-dense water with temperature constant as a function of depth), the thermocline (a region in which the temperature decreases and density increases rapidly with increasing depth), and a deep zone of dense, colder water in which density increases slowly with depth. Stratification forms an effective barrier for the exchange of nutrients and dissolved gases between the top, illuminated surface layer where phytoplankton can thrive, and the deep, nutrientrich waters. Stratification therefore has important implications for biological and biogeochemical processes in the ocean. For example, periods of increased ocean stratification have been associated with decreases in surface phytoplankton biomass. In coastal waters, prolonged periods of stratification can lead to hypoxia (low oxygen), causing mortality of fish, crabs, and other marine organisms. 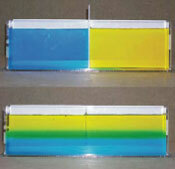 This activity compares salt and fresh water, demonstrating that fluids arrange into layers according to their densities. Students in grades 9-12 should read the Background section (p. 4-5) of Chapter 1 (Density) in preparation for this activity. Credit: Karp-Boss, L., E. Boss, H. Weller, J. Loftin, and J. Albright (2009). Teaching Physical Concepts in Oceanography: An Inquiry Based Approach. Oceanography 22(3), supplement, 48 pp.